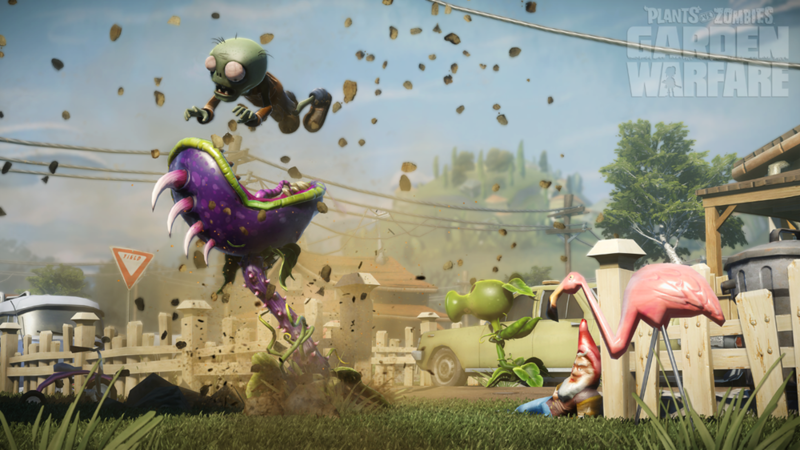 Plants vs Zombies Garden Warfare came out yesterday, bringing PopCap’s goofy tower defense game into the console third person shooter arena. I had to give it a spin and see how they accomplished this, so let’s get right into our First Opinion. The first thing of note is that this is a multiplayer focused game with a single mode playable solo or in local split screen. That mode is Garden Ops, which is the closest to the tower defense style the series is known for. Up to four players play as one of four plants – Pea Shooter, Chomper, Sunflower or Cactus – and defend their garden from 10 waves of zombie hordes before making an escape to Crazy Dave’s flying RV. Playing solo is doable, but since you can’t change plants during a match, it’s hard to level up your plants here and unlock your later abilities. So far I have played one Garden Ops mode as a pea shooter and got to the 10th wave before being steamrolled by massive hordes of zombies a few giant boss-level baddies. Versus play include Vanquish (deathmatch) and Gardens and Graveyards (capture point) modes. So far I have only tried Vanquish and it was a lot more immediate fun than Garden Ops. You unlock new abilities for your selected plant/zombie, such as the sun beam for the sunflower and the rocket launcher for the zombie foot soldier, through continued play so it pays to stick with one class. Playing also nets you in-game coins that can be spent on sticker packs to unlock character customization items as well as new variations on the existing classes. As for the actual game play, in the matches I played the action was often hectic but the maps still seemed a little big for the number of players involved. Everyone would either be centered on one small area or spread out and hard to find. We’ll be ready with a proper review in the near future, so hang around AAGH for the latest on Plants vs Zombies Garden Warfare.